A compact and sweet-sounding model that will delight singer-songwriters. Great value and eye-catching finish. There's a real sense of character. Big clunky preamps look inelegant, and no case or gigbag included. Given the sheer abundance of boutique instruments that debut each year, it's rare for the eye to be drawn by a mid-price acoustic. 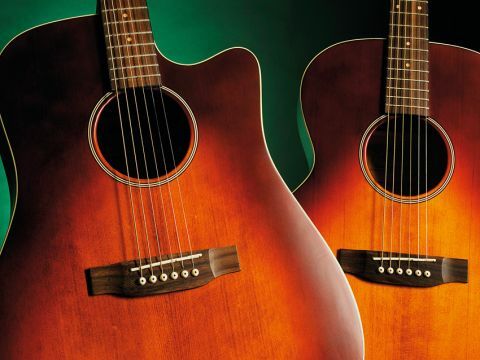 Takamine's new G-Series EG5403S proved a notable exception in 2007, sparking interest with its natural post-war finishes, and maintaining it with its lively raw materials and features. Takamine has always worked to bring diversity to the body shapes of the G-Series, so it's no surprise to find the full-bodied EG5403S available at £429. A major reason for that is the body itself. The NEX shape, needless to say, is a long-standing Takamine design, which we've seen many times before on countless different models, and it follows the standard contours again in this case. True, there's a sense of familiarity, but that doesn't lessen the visual impact, with the pinched waist and broad lower bout working well with the natural finish and white binding, and the lack of a cutaway accentuating the hourglass of the OM-style top bout. The slender 99mm rim depth also feels very comfortable. The design allows for an additional fret, though there's little benefit here because the non-cutaway design means you can't reach it. the bridge and 'board, and a nato neck locked via a dovetail. The build and finish are reassuring; it certainly has the edge over some cheaper Chinese Takamines we have tested. There is nothing structural to flag up and a delicious grain to the woods that should make this model a conversation piece. The TK-40 preamp makes another welcome appearance, and it deals equally well with the smaller dimensions of this model. Physically, the EG5403S is very accommodating, with the compact feel arguably even more manageable than an OM, the neck allowing rapid and unfussy shifting of chord shapes, and the overall impression suggesting a model that would be perfect for gigging singer-songwriters with a flair for fingerstyle. If there is a minor criticism, it's that more involved technique is virtually impossible beyond the 19th fret due to the lack of a cutaway. It might be compact, but the EG5403S turns in a thumping performance. In addition to a level of power that defies the slim contours, there's a superb sense of balance in the raw tone here. A rich low end and a sweet mid-range lend tonal complexity to simple passages, and a pin-sharp treble ensures there's never a sense of wallowing. The TK-40/piezo combination picks has a balanced string response and proves itself able to relay nuances, and thus enables you to pull off more than simple strumming. You find yourself forgetting the modest price and there's no higher compliment than that. Cynics will suggest the EG5403S is little more than a standard Takamine given a fancy - or indeed un-fancy looking - finish. But what's wrong with making mid-price acoustics look interesting? It's hardly a crime - especially when scratching the surface reveals good materials and admirable production values that translate into strong physical performances and interesting tones. The EG5403S is not aimed at true vintage fans - the visual vibe is only skin-deep - but for budget-conscious players who want to take the looks of yore on to the modern gig circuit, it's fair to say that this guitar delivers in spades.